It’s been a while since hand applique was on the front burner so when I wanted to drag out an old project and finish it up, I decided to look around and see what was new in the applique world. 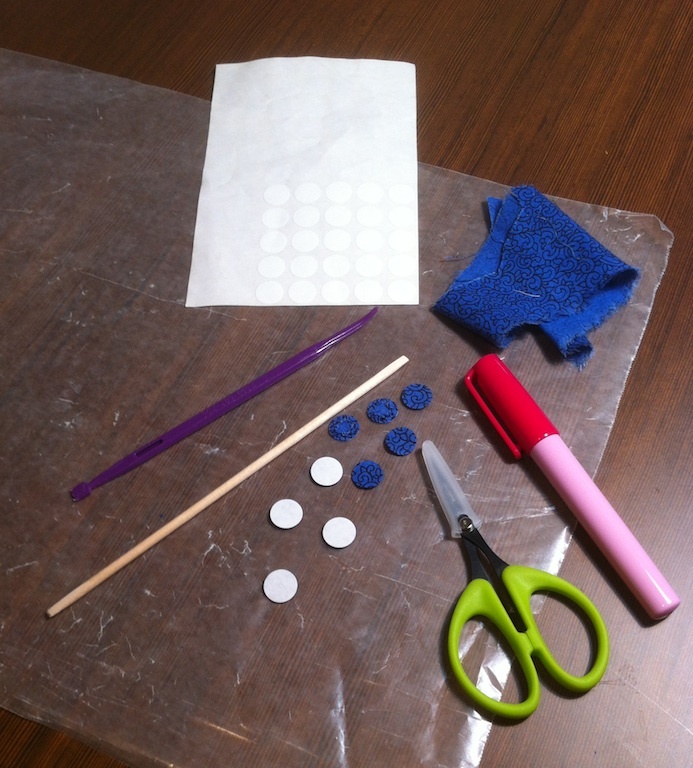 I found the excellent Craftsy.com class called Machine-Finished Hand Applique taught by Beth Ferrier and took a look. 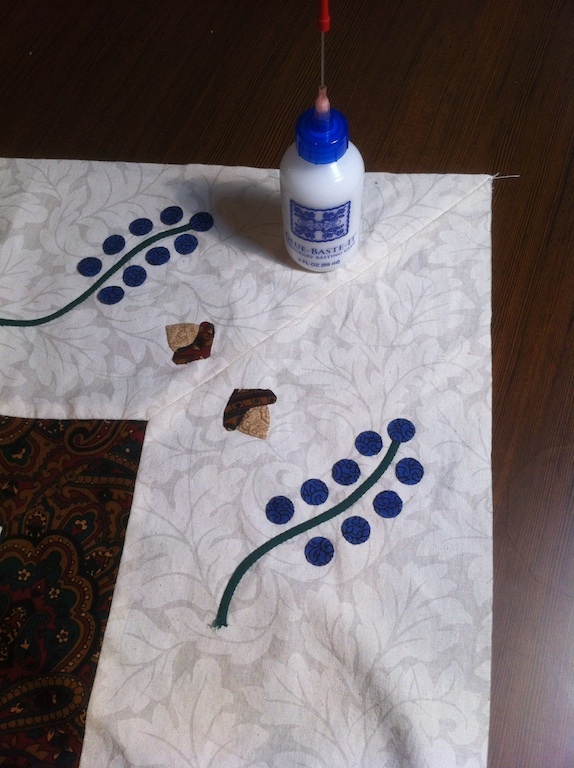 Oh my, glue basting applique pieces is an amazing step forward from either needle-turn or turn-and-baste over freezer paper! Beth suggests using regular office supply glue sticks as they are cheaper, readily available and she likes the squishy tackiness they give, but I did like this more expensive fabric glue pen by Sewline better than either the Elmer’s purple or standard office supply water soluble glue stick. I also found the “Purple Thang” stick a bit more responsive than the cuticle stick recommended in the class for pushing and turning fabric. Yes, again, it’s more expensive and only available from quilt notions suppliers while cuticle sticks are cheap and easy to find, but it really did work better for me and so was well worth the price. Actually, I use both tools at the same time for these very small circles, one in each hand. My fingers are too clumsy by half. Those little scissors with the green handles are by someone named Karen Kay Buckley and she calls them Perfect Scissors. The clerk at my favorite quilt shop insisted that if I was doing applique, I should have these little scissors and I should trust her on this. They are nice. Supposedly, their micro-serration prevents fraying and they do cut right to the tips and are very maneuverable to cut around complex shapes. I can’t speak to whether they prevent fraying since with this technique, the glue accomplishes that nicely. Sometimes you just have to trust. You can see above and below how nice and round my circles are using these new techniques, even though I used a slight variation on Beth’s instructions by putting adhesive dots on top of the fabric as a turning guide rather than freezer paper on the inside. Will all that glue wash out you ask? Well, once more I’m going to trust and not worry about it. Better to have a finished project with a little glue left in it after washing than a glue-free never-finished top lurking in a drawer. Look at those pretty little circles! Bring on the applique berries! Thank-you Beth! What is surprising about these chewy, sweet bar cookies? Only that they taste so rich and yummy you could swear they are larded with fat as well as sugar. Nope, just lots of brown sugar. 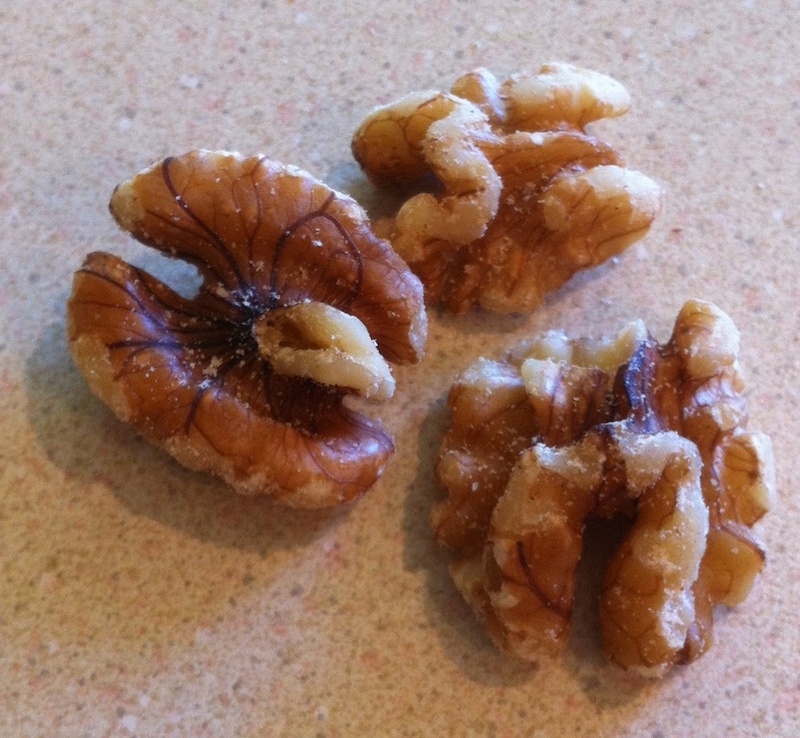 There is no added fat beyond what is naturally occurring in the eggs and walnuts. 8 oz. chopped walnuts, by hand or carefully in processor with pulses to prevent getting ground walnuts. You want a fairly coarse chop. Spread in a greased 9 x 13 pan. Bake at 350 degrees for 20-25 minutes. These are better under-baked than over-baked. When cool, cut into squares. Best to cut and serve as needed. Most of the time, keeping score makes life miserable since scores beg to be settled eventually, but in baseball, keeping score is the best way to enjoy the game. 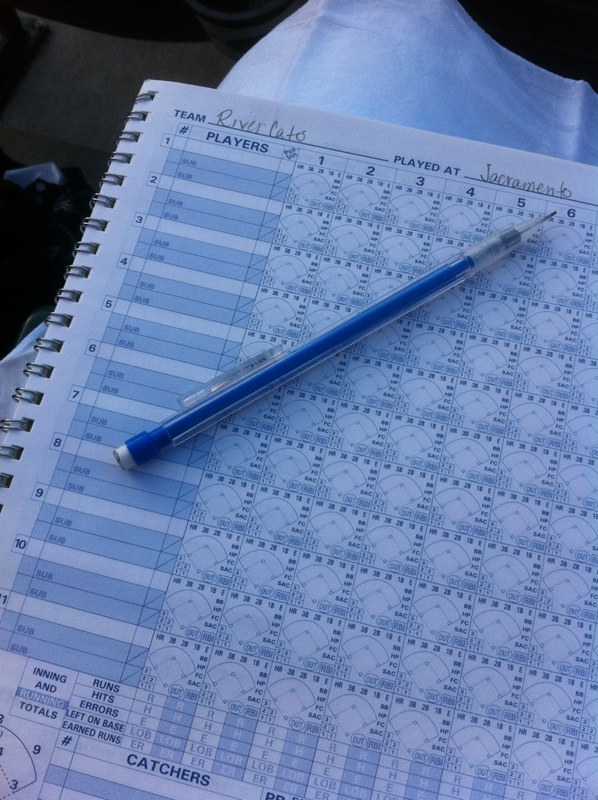 Never go to a ballpark without your scorebook! Sometimes, well okay, ALWAYS after you have used the handy scraper to remove all the paper from the sticker there is glue residue left behind. That’s where the peanut butter comes in. If the item is not going to be used in the kitchen, I use Goo Gone or some other solvent product, but for food prep or serving items, I don’t want to use solvents. They are not welcome in my kitchen. So a little peanut butter on a paper towel works like a charm. Rub that glue residue and watch it dissolve and disappear. 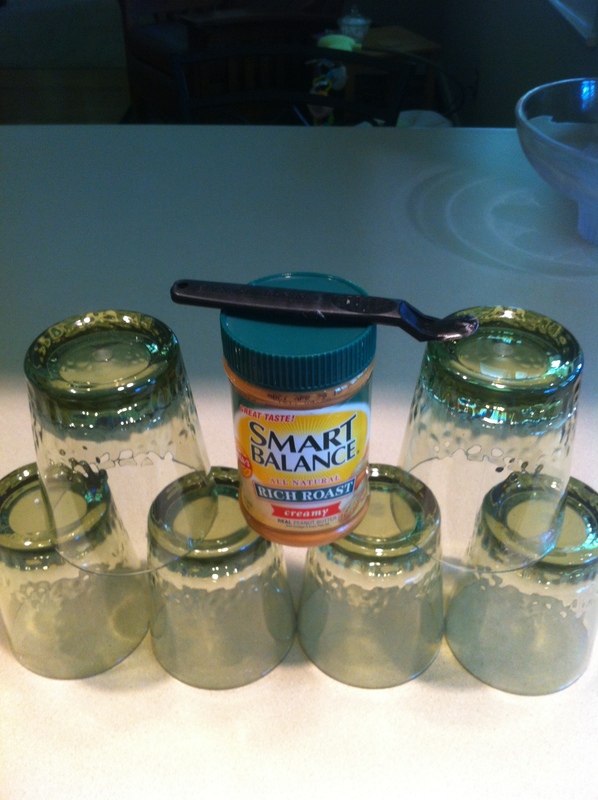 Yes, you now have a greasy smear of peanut butter on your glass (in this case), but a clean paper towel easily gets most of that off and a trip through the dishwasher finishes the job. You will never know there was a stubborn sticker there. Before I learned this trick I had some cups that retained a gummy residue in perpetuity, no matter how long I soaked them in sudsy water or how many times I sent them through the dishwasher. Laura on Who are these people?